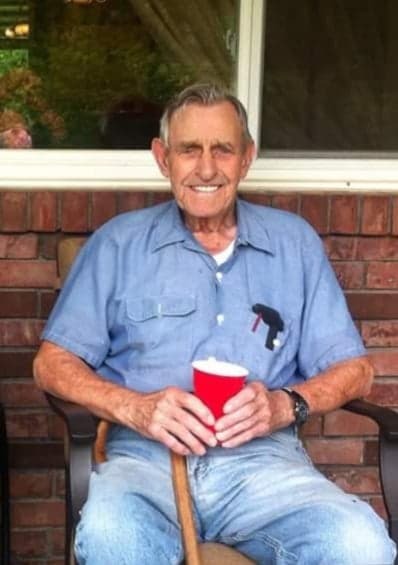 Oscar "Paul" McPeters of Steelville, Missouri passed away Friday, July 13, 2018 at Steelville Senior Living at the age of 90 years, 10 months and 19 days. Paul was born August 24, 1927 in Huntsville, Alabama to Earnest Berlyn McPeters and Juanita Bryd McPeters. In June of 1948, he was united in marriage to Mildred "Lavern" Weber who preceded him in death. Paul worked in construction in St. Louis and then was self-employed building houses in the early 1960's and 1970's in Salem and the Viburnum areas combining over forty years in construction. He also spent many hours farming. In his spare time, he enjoyed hunting and fishing. He was preceded in death by his parents; his wife, Lavern; infant son, Johney Dale McPeters; six brothers, Earl McPeters, Thomas McPeters, James McPeters, Eugene McPeters, Wade McPeters and Clayton McPeters; and one sister, Louise Tice; brother’s-in-law, George " Bob" Weber and John Weber, Jr.; and sister-in-law, Wilma Mabe. He is survived by his son, Dennis McPeters and wife Jamie of Steelville, MO; one daughter, Paulette Wallis and husband Tom of Sullivan, MO; four grandchildren, Travis Wallis, Chris Wallis, Wesley McPeters and Justin McPeters; six great-grandchildren, Abigail Wallis, Lilly Wallis, Owen McPeters, Elly McPeters, Myah McPeters and Addie McPeters; one brother, Charles McPeters of St. Charles, MO; sister-in-laws, Bonnie Garrison and husband Clarence of Steelville, MO, Faye Wright and husband Edwin of Rogersville, MO and Sue Asplin of Aurora, MO; and brother-in-law, Bill Weber and wife Linda of Steelville, MO. Graveside services were held at 11:00 a.m. in the Liberty Cemetery, Steelville, MO with Rev. Jerry Beers officiating. Special music of “Amazing Grace” was sung by Rev. Jerry and Shelly Beers. Committal prayer and burial were in the Liberty Cemetery. Honored to be casket bearers were Travis Wallis, Chris Wallis, Wesley McPeters, Justin McPeters and Owen McPeters.